Researchers from Hokkaido University have created artificial blood vessels using collagen derived from the skin of salmon. The researchers, who replaced the aortas of rats with the artificial blood vessels, claim to be the first to create and successfully test artificial blood vessels made using collagen derived from marine animals. The researchers decided to use salmon skin for regenerative medicine applications after seeing large amounts of the skin go to waste in local seafood processing operations. On Japan's northern island of Hokkaido, seafood processors discard about 2,000 tons of salmon skin each year -- enough to yield an estimated 600 tons of collagen. In addition, there are no known viruses transmitted from salmon to humans, so the use of salmon collagen is regarded as relatively safe. Scientists have created artificial tissue from bovine (cow) and porcine (pig) collagen in the past, but there have always been concerns over the possible transmission of infectious diseases such as BSE (mad cow disease). One problem the researchers faced early on was the salmon collagen's poor resistance to heat. 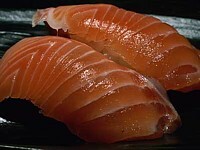 Because salmon collagen ordinarily melts at about 19 degrees Celsius (66 degrees Fahrenheit), it could not be used as a tissue replacement in humans. But by developing a process that forms the collagen into fibers and strengthens the bonds between molecules, the researchers were able to raise the melting point of the collagen to 55 degrees Celsius (131 degrees Fahrenheit). The heat-resistant collagen was used to create blood vessels with an internal diameter of 1.6 mm and a wall thickness of 0.6 mm. When grafted into rats, the artificial blood vessels demonstrated the ability to expand and contract along with the heartbeat, and they were shown to be as strong and elastic as the original aortas. Nobuhiro Nagai, from Hokkaido University, says the researchers plan to test the blood vessels in larger animals such as dogs. One day they hope to see their biomaterial used in humans as a replacement for damaged blood vessels, he says. The research results are set to be announced at a meeting of the Japanese Society for Regenerative Medicine (JSRM), which is scheduled to begin in Yokohama on March 13.